As choruses of “Irene, Goodnight” ring out from the more enlightened tenements in Greenwich Village, I can’t help regretting the days when storms were christened in more poetic fashion. We don’t yet know whether Hurricane Irene’s New York landfall — forecast for the wee sma’s of Sunday, August 28, 2011 — will enter the annals of history as a great disaster, but it did get me wondering about New York’s previous hurricane history. 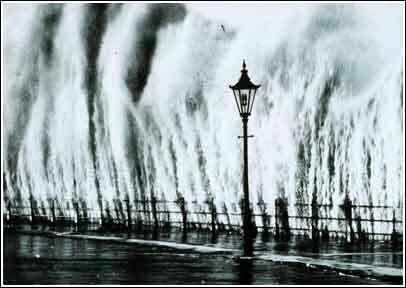 The City’s worst recorded storm took place in early September, 1821. It first made landfall in North Carolina, and roared up through the Delmarva penninsula and New Jersey before slamming into New York City and Long Island. This may sound unnervingly familiar if you have been following the track of our 2011 storm. But 1821 hit much harder than Irene is likely to do. 13 foot surges from both rivers pushed across the City, entirely flooding Manhattan south of Canal Street. Jeepers! 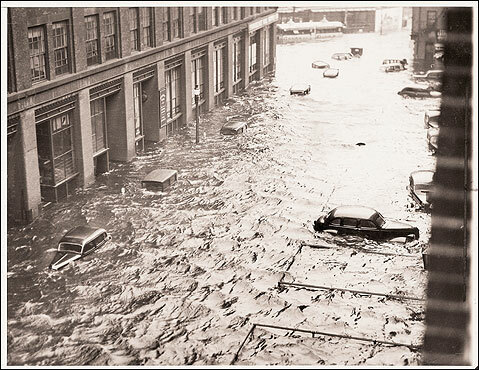 Then the City was hit again in 1938, by a storm now known as “The Long Island Express.” In that case, I think I’ll let the pictures speak for themselves. In all seriousness, we are well stocked with fresh water, non-perishable food, candles, and a battery powered radio. Our building stands in a zone that will only be evacuated in case of a much more serious storm. All our windows are closely flanked by other buildings — usually a source of frustration because of the miserable light that trickles down into our garret. But in this case, we are glad to be so well protected. At the worst, we may be without power for a day or two — a good excuse to turn off the computer and pay attention to something real. I’ll keep you posted. 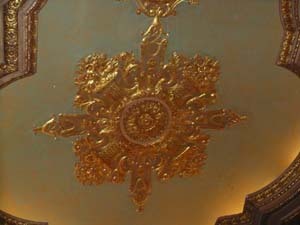 Last Sunday, we enjoyed the second half of our visit to the stately Landmark Loew’s Theatre of Jersey City (click here to read about the first part of our visit). It was a special performance sponsored by the Garden State Theatre Organ Society (who knew). That’s Don Kinnier, premier theatre organist of the east coast, tickling the key stops with his nimble fingers (and toes). If you ever get a chance to see and hear Mr. Kinnier, don’t stop to think, buy the tickets! Particularly if he is accompanying a film. Though I hear he has also been known to play the conservatory organ at Longwood Gardens. 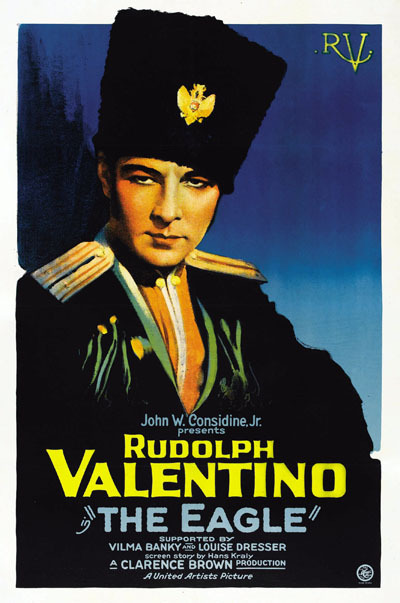 After the opening concert and a brief intermission, we got down to the feature presentation: The Eagle, considered by some critics to be Rudolph Valentino’s finest film role. It was surely one of his most varied performances, ranging from smoldering sensuality to laugh-out-loud humor. As my film-buff companion commented, it was the first time he’d seen Valentino’s teeth. This 1925 silent film has a great storyline, based on a story by Pushkin. It also boasts lush costumes and scenery, and a tracking scene of a laden banquet table that made film history. Louise Dresser shines as the lusty czarina who falls for one of her cossacks (Valentino), forcing him to flee to the arms of the lovely and mischievous Mascha (Vilma Banky). But let me not forget the real star of this particular screening — it was the impeccable sound track, provided by Mr. Kinnier and the Wonder-Morton. For 87 minutes, he played a solid wall of music, capturing every shadow and nuance of the film, including a dance scene where you’d swear the actors were moving to the music and not the other way around. I’ve never seen anything like it, and though my companion has seen far more silent films than I, he also assured me that this was a true tour de force. Jealous? Well I don’t think you’ll have the chance to see Mr. Kinnier at the Loew’s anytime in the near future, but you can still catch the magic of a silent film screening with live organ music (sure to be provided by another excellent musician) on Saturday, May 21, when the Loew’s will present Murnau’s Sunrise. I’ll be there. In these days of 3-D and cineplex, we often bemoan the fall of the movie theater. Not that we aren’t grateful to live within an easy walk of six great film centers (Anthology Film Archive, Film Forum, IFC Center, Angelika, Cinema Village, and Sunshine), but none of them really capture the grandeur that once surrounded the silver screen. And there simply aren’t enough revivals. 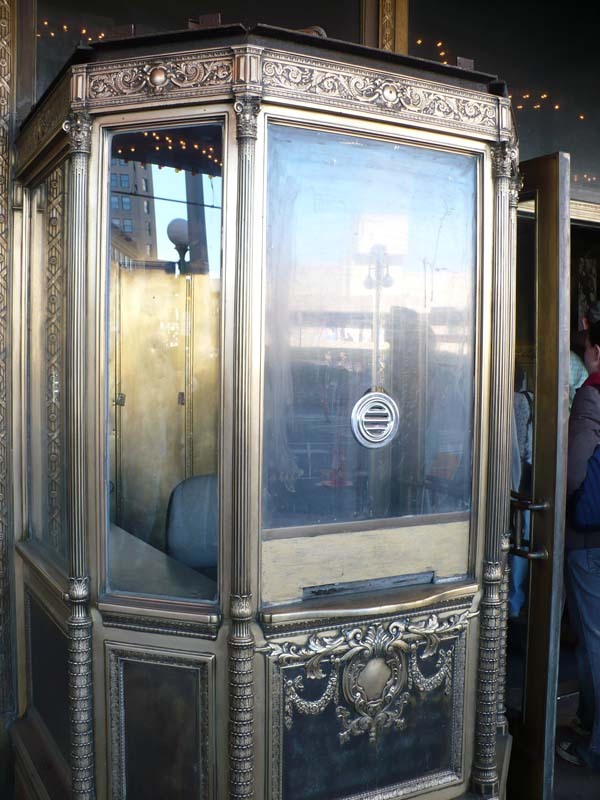 Then I heard about the Landmark Loews of Jersey City from a colleague who has been volunteering there, helping to restore the balcony seating. This April, after failing to convince my darling husband to attend a showing of L’Avventura (he hated it in 1960) at Anthology’s brilliantly titled “Boring Masterpieces” series, he agreed to take me to the Landmark Loews instead. They only show films one weekend a month — not bad considering that the entire operation is staffed by volunteers and much of the interior is still under restoration. The offerings on April 30/May 1 were “The Thing From Another World” (both the 1951 and 1982 versions) on Saturday evening, or “The Eagle” on Sunday afternoon. He wanted “The Thing,” I wanted Valentino. So we compromised and rented a hotel room in Jersey City so that we could attend both shows. Both our hotel and the theater are located steps away from their respective stops on the PATH train, so transportation was a breeze. When we arrived at the theater on Saturday evening, we were at first dismayed to see a line snaking around the block (little did we know that the 50 odd people waiting would be quickly swallowed up by the theater’s massive interior). 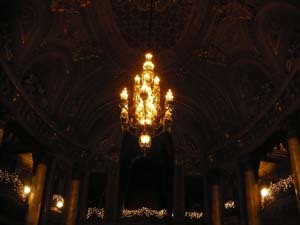 While we waited to buy our tickets, there was plenty of time to take in the beautiful building. Once we entered the luscious lobby, we were greeted by volunteers selling tickets (a steal at $7, $5 for seniors and children) and concessions ($1 for popcorn or soda, $2 for candy). 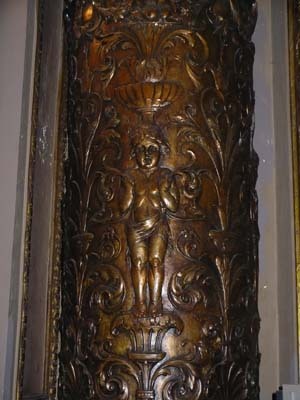 Alas, there were no cigarette girls, but perhaps that’s something that will be added once the restoration is complete. 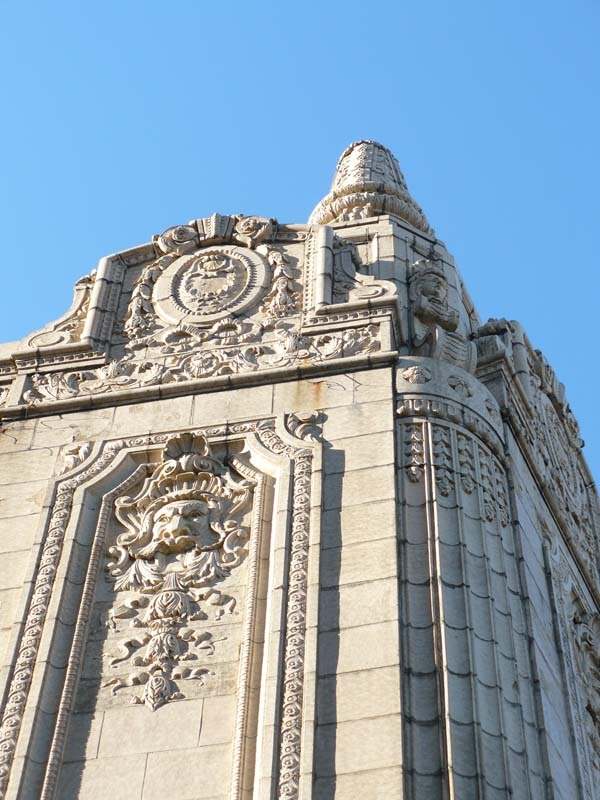 While the exterior is impressive for its sheer size and exquisite terracotta, the interior was breathtaking, despite (or perhaps because of) its air of decaying glamor. I know they are working away like beavers to restore it, but I do hope they leave a few of the cobwebs! What character, what charm. None of the snap shots I took inside came out very well, so you will just have to go and see it for yourself. I doubt if even the finest photographer could do it justice anyway. And here are a couple of details that didn’t get too badly washed out. Believe it or not, the lobby was nothing compared to the theater itself. 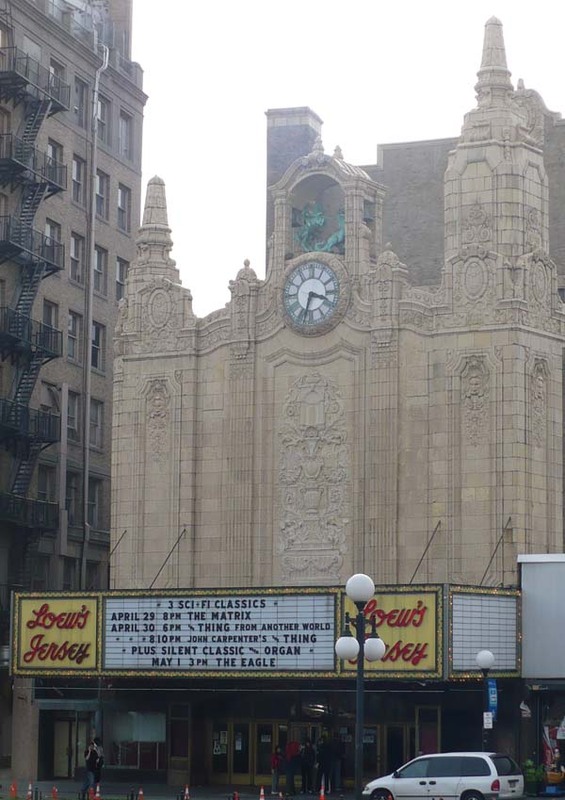 Opened in September of 1929, the Loews seats 3,100 people. My companion nearly burst into tears when he walked in, and by the time RKO came up on the screen, I was ready to bawl myself. We only stayed for the 1951 version of “The Thing.” It was a hoot, with a young James Arness in a surprise role. Best of all, the audience seemed very much alive, very much involved — not only with the film, but with one another as well. Perhaps it’s the low seats (no neck rests) or the shared experience of sitting in that magnificent space, but I’ve rarely been part of such a collective, genial audience. We laughed at all the corny jokes, and held our breath together when the hero was in danger. Needless to say, we walked out in a dream, eager to return the following day. My parents visited last weekend, and brought a dainty treasure. This set of perfume, eau de toilette, and talcum powder belong to my grandmother. She’s kept them on her dressing table for nearly 80 years — since her beau (the one before my grandfather) gave them to her as a gift in the 1930s. Needless to say, I am honored to have been entrusted with their safe keeping now that Gram is beginning to sort through her things and pass them on. It went out of production in 1969, but Evening in Paris was revived in the late 20th century, and is now available from The Vermont Country Store. An online review claims that the new stuff doesn’t quite measure up to the original version however. 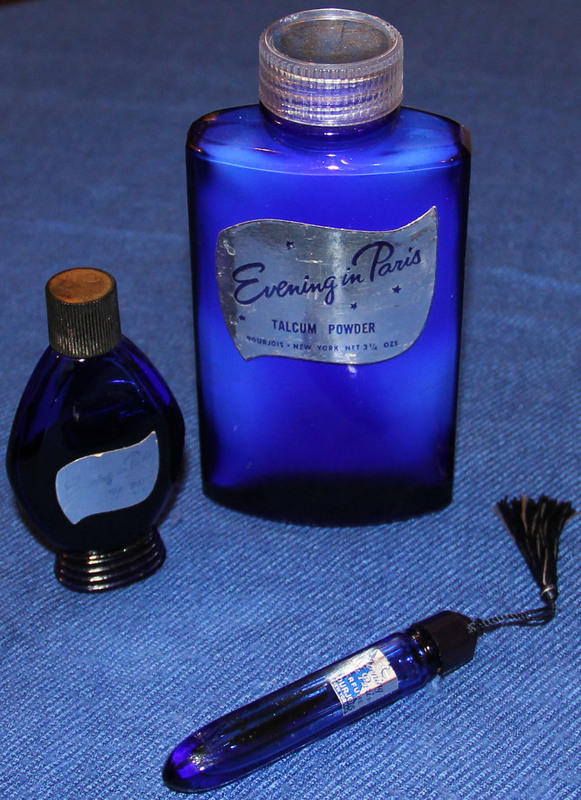 Back to my grandmother’s set: the perfume in the tiny bottle is long gone — either used or evaporated — but there is still a fair amount of eau de toilette remaining in the larger bottle. And there is plenty of delicately scented talc in the glass shaker as well. The fragrance is elegance personified. It’s rather powdery, as are most from this era (think Je Reviens by Worth), but the top notes are the lightest, sweetest, most exotic florals I’ve ever smelled. Chanel No. 5 is gauche by comparison. Sorry Coco. And on that (top)note, I shall bid you good evening.